At Spark Innovations we have developed with Steve Archambault his latest invention: The Smart Tab. His idea is based on a remarkably simple idea: The Smart Tab. 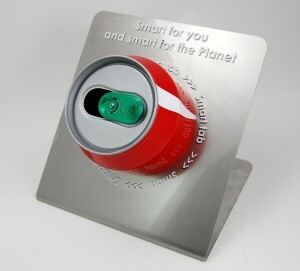 The Smart Tab is designed to rotate around the top of the beverage can rather than be pulled up and away from the can. This simple change prevents debris as well as insects from getting into the can, and most importantlyremind everyone to be environmentally conscious. Steve Archambault, inventor of the Smart Tab, projects the worldwide royalty revenues from this tab to be in the hundreds of millions – if not the billions – over the next several years. Unlike most entrepreneurs, however, he’s not driven by the need for personal wealth. Steve will allocate most of his revenues to funding efforts to address the world’s most pressing crises. In fact, addressing these crises is the driving force behind his commercial realization of this invention.At Spark we are proud to have helped Steve Archambault in his venture. “One of the biggest helps along the way was a fellow by the name of Bob Dickie from Spark Innovations. I had no idea how to produce what I had visioned. So I spent a few months researching product development companies and that’s when I came across Spark Innovations. I wouldn’t be where I am at today if it wasn’t for Bob Dickie and the amazing staff at Spark Innovations. They were able to take my concept and transform it into what you see today and will see on all beverage cans soon. My experience with Bob Dickie and Spark Innovation has far exceeded what I had expected from a company.